DES MOINES, Iowa — Hours before any votes were cast in the caucuses here Monday night, U.S. Sen. Ted Cruz was already imagining victory in the next nominating contest — or at least his version of it. "The conservative isn't supposed to be in second in New Hampshire!" Cruz exclaimed at a pre-caucus rally in Marion, making reference to polls that show him doing surprisingly well in a state that tends to reward more moderate candidates. Before Monday night, the Texan presidential hopeful was already poised to beat expectations in the Granite State's Feb. 9 GOP primary as the beneficiary of a splintered race for establishment support there. With his victory over billionaire Donald Trump in Iowa, however, Cruz now heads to the next state with a wider opening than ever. It's not just the usual momentum that comes from winning the first-in-the-nation caucuses, according to his campaign. It's that his win in Iowa exposed Trump's support as essentially artificial — overstated in public polls and not backed up by a serious get-out-the-vote effort. "When the rubber hits the road is when people actually go to the polls or go to the caucus and vote," Cruz spokesman Rick Tyler told reporters here as it became clear the senator would win the caucuses. For Trump, "that didn't happen here in Iowa. I don't think it's going to happen anywhere else." To be sure, Trump remains the odds-on favorite in New Hampshire, regularly registering double-digit leads over Cruz in the state. Cruz himself has seemed to concede Trump will finish first, recently imagining South Carolina as the rubber match if he takes Iowa and Trump takes New Hampshire. "We had a poll — we're 28 points ahead. New Hampshire — we love New Hampshire," Trump said Monday night as he conceded to Cruz at his Election Night party in Des Moines. "On to New Hampshire!" Trump added before leaving the stage. Trump may not be Cruz's only problem in the Granite State. U.S. Sen. Marco Rubio of Florida is heading to the state with his own kind of momentum after posting a stronger-than-expected showing in New Hampshire, placing third just 4 points behind Cruz. Ethan Zorfas, Cruz's New Hampshire state director, was not ready to discount Trump's wide leads in the state when reached early Tuesday morning. But he said Iowa provided a template for how to beat Trump in the next nominating contest, regardless of poll numbers. "I think the big takeaway is how much ground game and organization matters. I think we saw that in Iowa tonight," Zorfas said, adding that the campaign has been "building the same machine" in New Hampshire. Among the bullet points of Cruz's organization in New Hampshire: More than 50 pastors who can get out the evangelical vote, which is smaller there than in Iowa but not insignificant; over 300 precinct captains to deliver votes come Feb. 9; and a volunteer residence in the Manchester area similar to the one the campaign had in Des Moines. Claiming victory here at the Iowa State Fairgrounds, Cruz did not waste time turning his attention to New Hampshire, saying the state will be won by campaigning one VFW hall and Dunkin' Donuts at a time. 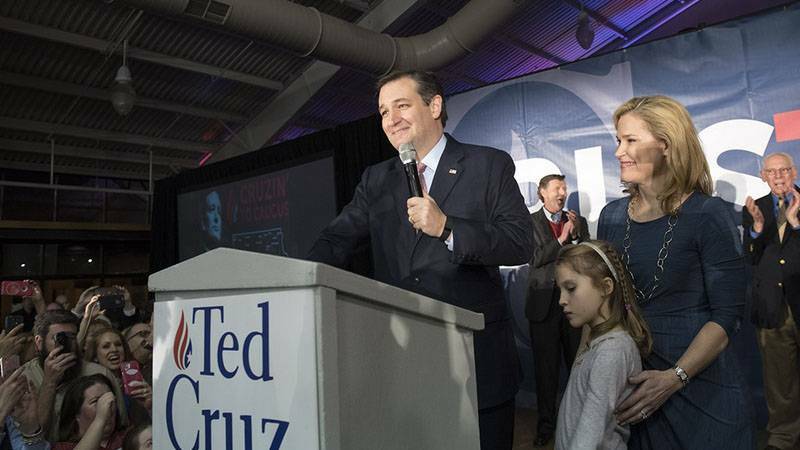 Cruz also evoked former President Ronald Reagan in a direct appeal to Granite Staters. "Thirty-six years ago, you welcomed to the Granite State a candidate running for president. He was also deeply disliked by the Washington establishment and the Washington cartel, a candidate who had been dismissed outright by the media," Cruz said. "Some polls had him 15 to 20 points behind, but you refused to let the establishment and the cartel and the media do your thinking for you. You refused to let them tell you how to vote." Cruz was set to board a plane to New Hampshire early Tuesday morning, hoping to avoid a major snowstorm bearing down on the Midwest. Aside from a rally Tuesday evening in South Carolina, Cruz is set to spend all his time in New Hampshire between now and its Feb. 9 primary, holding at least 17 events across the state with momentum on his side. It was a sequence Cruz had all but predicted in Marion, where he roused supporters with a scenario that was not as certain at the time. "We win tonight in Iowa," he said, "and we go with a head of steam into New Hampshire."